Signed and dated l.r. corner, white oil "W Dobell. 43". William Dobell: his life, art and home , 'Return to Australia, the war years', pg. 27-35, New South Wales, 2011, 28, 34 (colour illus. ), 137. 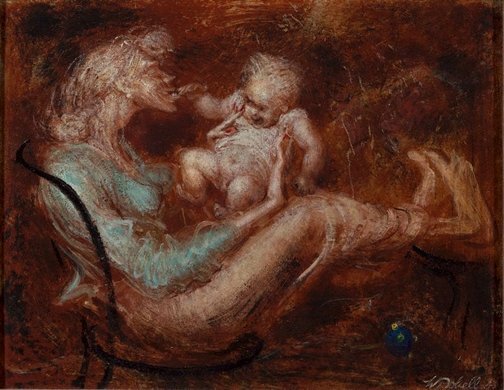 William Dobell: an artist's life , 'The War years', pg. 57-69, New South Wales, 2010, 61, 62 (colour illus. ), 201 (colour illus.). Yvonne Preston, The Sydney Morning Herald , 'Hunt for "borrower" as Dobell work is recovered', pg. 3, Sydney, 28 Aug 1984, 3 (illus.). Article about the theft and recovery of the painting from the Gallery in August 1984.